There’s a big change looming on the horizon for America’s favorite hybrid, and it’s one that has the potential to fundamentally change the daily commutes of drivers all over Long Island. The details of something this huge deserve to be shared and that’s why we here at Westbury Toyota are going to spill everything we know about the new AWD Prius. We’re beyond hyped for this development and what it means for hybrid cars moving forward – and we know that after you read this, you’ll be excited too. Typically, a Prius isn’t the first car that comes to mind when you think about vehicles that take advantage of all wheel drive (AWD) setups. That’s about to change, as the 2019 Prius will be available with the option for an electric all-wheel drive system (known as AWD-e). 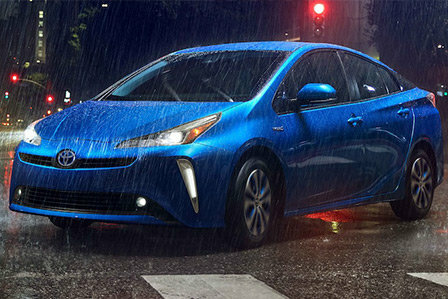 Drivers that opt to go with the new AWD Prius will have themselves a car that can not only handle ice and snow, but also delivers a more than impressive 52 miles per gallon (mpg) in the city, 48 mpg on the highway, and 50 mpg combined. As Jon Fingas of Engadget explains, the AWD-e system centers around a self-subsistent electric motor that constantly powers the rear wheels up to six mph (miles per hour). It can continue to provide rear-wheel power at a speed of up to 43 mph, if needed. Because this independent motor doesn’t require front to back driveshafts, it doesn’t take up any of the sedan’s cargo space. There are some differences between the front wheel drive (FWD) 2019 Prius and the AWD model, with the one of the most notable being the battery pack. The AWD Prius uses a metal hydride battery, whereas the FWD versions use lithium ion technology. The 2019 AWD Prius received a bit of an overhaul design-wise, as the styling in the front and rear have undergone some refinement. The end result is a cleaner overall appearance that still maintains its individuality. The exterior is not the only thing that underwent some alterations, as the interior has seen some adjustments including a 4.2-inch multifunction display that provides drivers with useful information such as torque distribution. Opting to go with a Limited model, explains Frank Markus of Motor Trend, also gives you access to stolen vehicle locating, collision notification, and emergency assistance (among other perks) – all free for a three year period. Standard in both trim levels is Toyota’s Safety Sense-P suite, giving you access to some pretty crucial safety features such as adaptive cruise control, lane-departure warning, automatic emergency braking with pedestrian detection, and automatic high beams. There’s a reason that the Toyota Prius is North America’s most popular hybrid car, and that’s because it provides a unique blend of reliability, style, and comfort that other sedans in its class lack. The AWD-e Prius is no exception, providing everything we’ve listed in addition to the dependability of all-wheel drive. This substantial change does not negatively influence the car’s renowned efficiency, either; with its impressive fuel mileage, the AWD-e Prius is miles ahead of any other hybrid. If you’ve been on the fence about purchasing a 2019 hybrid (or have been thinking about upgrading to a 2019 Prius), the AWD-e Prius is the car that you’ve been waiting for. You’ll be getting a car with unparalleled fuel efficiency, distinct interior and exterior style, and the added bonus of an all-wheel drive system that ensures that no matter where you’re driving, you’ll get the power you need to stay safely on the road. If this all sounds like precisely what you’re wanting, don’t hesitate to pay us a visit here at Westbury Toyota. We’ll be more than happy to get you better acquainted with the 2019 AWD Prius.